Wouldn’t it be nice to have an algorithm plan all of our vacations? 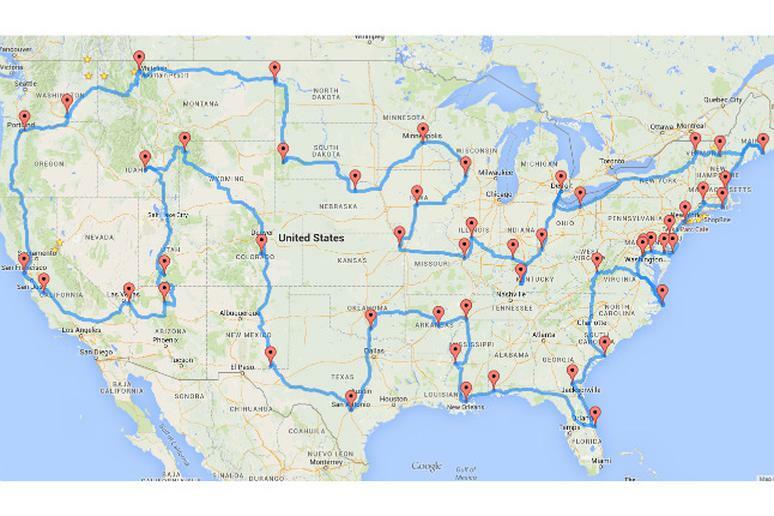 It may be the most romanticized vacation ever—the great American road trip. Just about every avid traveler has thought about doing it at some point and anyone who’s seriously considered it knows that planning can seem nearly impossible. With all the things to see in the continental U.S. and the many possible routes, the options are nearly limitless and that can quickly turn into a headache. When you introduce technology, though, the daunting task is that much easier. Discovery News partnered with Michigan State University doctoral student Randy Olson, who works on algorithms for travel routes. There were only three rules: there must be at least one stop in each of the 48 states in the continental U.S., each stop would need to be at National Natural Landmark, National Historic Site, National Park, or National Monument and the trip would have to be done by car (and not leave the U.S.). According to Olson, the trip would take between two and three months to complete and seeing that many of the stops are close to other incredible sights and activities, it could easily take you—well, forever. Olson said his algorithm didn’t look at every possible route, but instead came up with the best route of many, many different trials. So where does this road trip lead? Take a look at Olson’s blog for other maps.